This method for analysis and planning is considered to be created by Albert Humphrey from Stanford Research Institute, while he was making some research during the 60s and 70s of the 20th century, using data for some companies in the Fortune 500 list. In fact, SWOT analysis is a method not only for analysis, but also for planning. And this is important, because no matter how detailed and accurate an analysis is, it gets generally useless without some planning as a subsequent step. After all, why should you analyse something that concerns your company if you do not intent to improve it or use it as an advantage in any way? What is SWOT analysis used for? SWOT analysis is a method of strategic planning, which is used to make an assessment of the strengths and weaknesses of your company, product or service; and compare the opportunities you need to take advantage of with the threats, which you need to avoid. This way you are supposed to easily identify what you do best and you will be able to find the most appropriate way that your company needs to follow in order to gain success. It is very important to be absolutely aware of all positive and negative factors that are standing in your way when starting your business. You will save yourself a lot of unpleasant surprises in the future and you will be able to prepare yourself for the difficulties that are to follow and meet them adequately. There are various ways of sorting out the data in order to analyse it. However, it seems that the tabular form is the easiest one to use. In addition, you should know that every aspect of your SWOT analysis requires some time, efforts and persistence in order to get the results you want, but it is worth it. unfavourable government policies, such as enhanced tax deductions, etc. What is the SWOT matrix used for? The SWOT matrix is an important management tool that combines the organization’s inner strengths and weaknesses with the external threats and opportunities and helps the managers of the company realize the risks and future possible strategies. After all, knowing what strengths and opportunities to use is a crucial part of your company’s development. 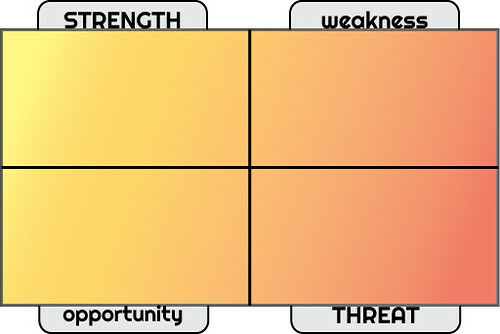 The SWOT matrix generates some alternative strategies, but it does not select or determine which one is the best. Jane Mires is passionate about everything related to business. She currently works as a manager of http://www.qualitycleaninglondon.co.uk/cleaning-services-nw6-kilburn/ and she loves her job. Thanks to it she has so much experience which she shares with her readers.